Face it. Smartphones are a fad. Tablets? Simply an unruly smartphone that got too big for its britches. Who needs them? Didn't we do just fine all of these years without them and without all of this crazy untethered connectivity? And the idea of using smartphones and tablets for work, so users can be more mobile and flexible? Is that really such a good thing, all these people out there doing work wherever they go, any time of day? 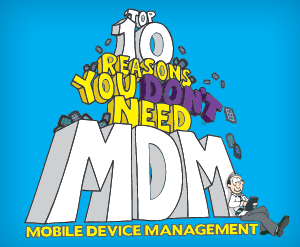 Before you take that fatal next step in allowing mobility, security, BYOD and user flexibility, carefully read these top 10 reasons why you don't need mobile device management.